In order to receive academic support and accommodations in college for a learning disability, such as dyslexia, a student has to formally declare their disability to the academic support office of the college by providing appropriate documentation about that disability. Usually this is a neuropsychological evaluation and should be completed within three years or less of the college application. We began this process in the summer prior to my daughter’s last year of high school. We were careful to choose an evaluator to complete the neuropsychological testing who specialized in the transition from school to college. 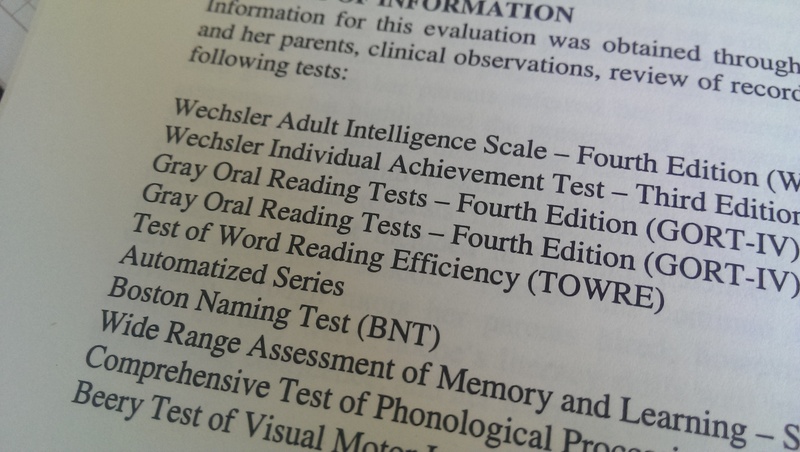 This included the adult version of the Wechsler intelligence test (Wechsler Adult Intelligence Scale–Fourth Edition), as this is what the colleges want to see, as well as the Wechsler Individual Achievement Test–Third Edition (WIAT), Gray Oral Reading Tests (GORT), Test of Word Reading Efficiency (TOWRE), Wide Range Assessment of Memory and Learning (WRAML), and others. The report we received following the testing was clear and concise, and included recommendations appropriate for college. Unfortunately, in the past, not all evaluators have provided easy-to-read reports, nor have their recommendations been appropriate for the child or circumstances. Along with the report being used as formal documentation of my daughter’s disability, we also used it as a guide when asking the support office for accommodations. Looking through the report, there were a number of recommended accommodations for college: additional time (i.e., time and a half) on tests and exams, use of note takers, a computer/laptop, audio books, and technology such as Dragon Naturally Speaking or Co-writer, and a reduced course load. According to her college web site, the most common accommodations requested are: extended time for in-class examinations (up to double time); extended deadlines for major/term projects up to 24 hours; quiet, distraction free environment to take examinations; rest breaks, as needed, during examinations; permission to leave the studio, without penalty for brief periods of time; frequent meetings with the instructor to discuss course content or pending assignments; access to student note takers; access to e-text and books in alternative formats provided by the resource department; undergraduate course load adjustment. My daughter requests a few of these and has been provided with note taking services; class notes, textbooks and other materials provided in alternative formats using e-text; extended time for class assignments with lengthy reading and writing comprehension; permission to record lectures; required reading available days in advance; professor assistance with clarification of material or assignments. However, even a few weeks into the semester, some of these accommodations are not panning out as easily as we thought. In a school setting it is okay for the parents, a specialist such as the external psychologist, or an advocate to sit in a meeting an ensure the appropriate accommodations are written into a child’s educational plan. In college, apart from initially going through the report with my daughter and advising her on the accommodations to request, as an adult she is on her own, advocating for her own accommodations. So, when she was provided an accommodation for using a laptop for exams, there was no one else to suggest that this accommodation should include being able to use her laptop for taking notes in lectures, as well! Nor was she prepared for one lecturer telling her it was against school rules to record lectures. Or, when she arranged, through the college library, for one textbook to be provided in e-format, it did not include audio. So, although accommodations in principle are a good idea, the reality of accommodations that are beneficial is proving much more difficult.